As expected the euro moved toward the upside, reached our target at 1.1334, and then exceeded it by 26 pips. This recent advance appears very convincingly to be a fifth wave, suggesting that the rally from 1.1175 until now is itself an impulse, which would mean that its larger correction is actually a zigzag. In other words, if this count is correct, we’re still in for more euro gains. By moving above 1.1360, price should move higher to reach between 1.1369 and 1.1391, while remaining above 1.1299 and very likely above 1.1328. 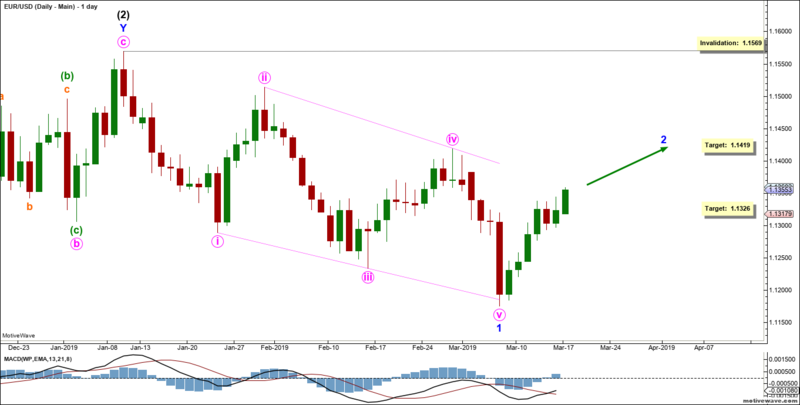 Elliott Wave chart analysis for the EURUSD for 15th March, 2019. Please click on the charts below to enlarge. Black wave (2) formed a running double combination labeled blue waves W, X and Y. 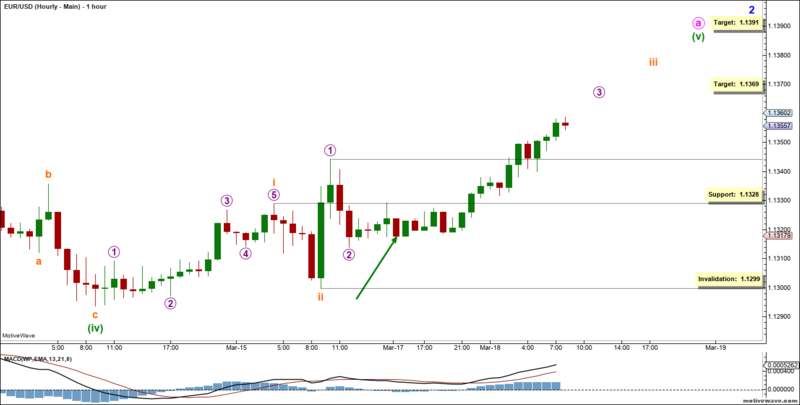 It retraced 38.2% of black wave (1) at its highest point, and it ended a little below the 23.6% retracement level. Black wave (3) is forming an impulse labeled blue waves 1 to 5. Blue wave 1 most likely formed a leading diagonal labeled pink waves i through v.
This count expects the euro to start moving toward the upside in blue wave 2. At 1.1326 blue wave 2 would retrace 38.2% of blue wave 1, then at 1.1419 it would retrace 61.8% of its length. These two targets coincide perfectly with the highs of the two upswings within blue wave 1. This adds even more confidence in this new view. This wave count would be invalidated by movement above 1.1569 as blue wave 2 may not move beyond the start of blue wave 1. This main hourly count sees that blue wave 2 is likely forming a zigzag labeled pink waves a, b and c.
Pink wave a is likely forming an impulse labeled green waves (i) through (v). Green waves (i) through (iv) are complete. Green wave (v) is likely forming an impulse labeled orange waves i through v.
This count expects the euro to move toward the upside in orange wave iii. This would be further confirmed by movement above 1.1360. At 1.1369 orange wave iii would reach 200% the length of orange wave i, then at 1.1391 it would reach 261.8% of its length. This wave count would be entirely invalidated by movement below 1.1299 as orange wave iv may not move beyond the start of orange wave iii. The impulsive count itself would be invalidated by movement below 1.1328 as orange wave iv of this impulse may not enter the price territory of orange wave i.